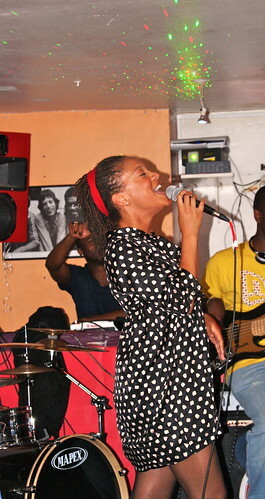 Katrina Bello, Summer 2010 London Program, shares a post about a thrilling open mic experience in London. Read more from Katrina here and here. I’m still floating…so, excuse me, while i kiss the sky. I just had one of the most amazing experiences in my lifetime. I know, that sounds really intense, but it really is that serious. I went to an open mic tonight at Troy Bar in Hoxton. I’ve been twice before and it just is all together a dope place to be. Ya’ll know I’m all about vibes. The vibe here is just my speed. Dope. Dope. and Dope. The host is a brilliant vocalist with a wit and charm about her. Plus, she makes everyone feel so at home. The dj plays all those songs that make u say “daaaaaaaaang…this used to be my joint!” Yep. It’s like that. and the band…the band is wicked, as they would say here in London lol. I’m just finishing my first day back at work. I still haven’t really processed that I am back in Boston. While it’s nice to be back with my family, I already miss New Orleans, and the work we were doing. It’s now Tuesday evening and we have officially survived our first day on the work site.